The General Captaincy of Chile (Capitanía General de Chile [kapitaˈni.a xeneˈɾal ðe ˈt͡ʃile]) or Gobernación de Chile, was a territory of the Spanish Empire, from 1541 to 1818. It comprised most of modern-day Chile and southern parts of Argentina. Its capital was Santiago de Chile. In 1818 it declared itself independent, becoming the Republic of Chile. It had a number of Spanish governors over its long history and several kings. The General Captaincy of Chile was incorporated to the Crown of Castile as were all the other Spanish possessions in the New World. The General Captaincy of Chile was first known as New Extremadura (a name subsequently given to a part of Mexico) and then as Indian Flanders. The Captaincy was a part of the Viceroyalty of Perú. The administrative apparatus of the General Captaincy of Chile was subordinate to the Council of the Indies and the Laws of the Indies, like the other Spanish colonial possessions. The day-to-day work was handled mostly by viceroys and governors, who represented the king in the overseas territories. The areas of the Americas, which had been the site of complex civilizations or became rich societies were usually referred to by the Spanish as "kingdoms," such as the " New Kingdom of Granada", the " Kingdom of Mexico", or the " Kingdom of Guatemala." Chile never reached the status of a viceroyalty and was instead classified as a captaincy general because this was a very warlike territory and thus was ruled by a military and not a nobleman like a viceroy. In 1536 Diego de Almagro formed the first expedition to explore the territories to the south of the Inca Empire, which had been granted to him as the Governorship of New Toledo. After Almargo's death, Pedro de Valdivia solicited and was granted in 1539 the right to explore and conquer the area with Francisco Pizarro's approval. Valdivia founded the city of Santiago del Nuevo Extremo and a few months later its cabildo (municipal council) appointed him governor and Captain General of New Extremadura on June 11, 1541. Other cities founded during Valdivia's administration were Concepción in 1550, La Imperial in 1551, Santa María Magdalena de Villa Rica and Santa María la Blanca de Valdivia in 1552, and the following year Los Confines and Santiago del Estero on the eastern side of the Andes. In 1553 Valdivia also founded a series of forts for protection of the settled areas: San Felipe de Araucan, San Juan Bautista de Purén and San Diego de Tucapel. After Valdivia's death that same year, these last forts, Villarica and Concepcion were lost. they were recovered following the war with Lautaro and Caupolicán. Following the defeat of the Mapuche by García Hurtado de Mendoza, settlements continued to grow and more cities were founded: Cañete de la Frontera on the site of the former Fort San Diego de Tucapel and Villa de San Mateo de Osorno in 1558, San Andrés de Angol in 1560, Ciudad de Mendoza del Nuevo Valle de La Rioja in 1561, San Luis de Loyola Nueva Medina de Rioseco and San Juan de la Frontera in 1562, and Santiago de Castro in 1567. Martín García Óñez de Loyola founded a last city south of the Bio Bio River, Santa Cruz de Coya, in 1595. A Mapuche revolt was triggered following the news of the battle of Curalaba in on the 23 of December 1598, where the vice toqui Pelantaru and his lieutenants Anganamon and Guaiquimilla with three hundred men ambushed and killed the Spanish governor Martín García Óñez de Loyola and nearly all his companions. Over the next few years the Mapuche were able to destroy or force the abandonment of seven Spanish cities in Mapuche territory: Santa Cruz de Coya (1599), Santa María la Blanca de Valdivia (1599), San Andrés de Los Infantes (1599), La Imperial (1600), Santa María Magdalena de Villa Rica (1602), San Mateo de Osorno (1602), and San Felipe de Araucan (1604). In the 17th century, the Spanish colony of Chile saw a rearrangement of its population center. While in the 16th century, most of the cities founded by the Spanish were located from Bio-Bio southward, with only Santiago, La Serena and some transandine cities located north of it, in the 17th century, Spanish authority and settlements were bought down south of Bío-Bío Region. The colony went from being a gold exporter with potential for expanding to the Strait of Magellan to being one of the Spanish Empire's most problematic and poor in natural resources. The Spanish Empire had to divert silver from Potosí to finance a standing army in Chile to fight in the Arauco War. Since the raids of Francis Drake in Chilean waters more seaborne assaults followed in the 17th century, mostly from Dutch corsairs. The Spanish Empire's attempts to block the entrance to the Pacific Ocean by fortifying the Straits of Magellan were abandoned after the discovery of Drake's Passage, focusing then on fortifying the coastal cities of Chile. As noted, the area had been designated a governorship (gobernación) during the initial exploration and settlement of the area, but because the local Amerindian peoples demonstrated fierce resistance, a more autonomous, military-based governmental authority was needed. Thus, the governor was given command of the local military and the title of captain general. This arrangement was seen in many places of the Spanish Empire. Chile lost more than half of its territory with the Bourbon reforms of Charles III, when all of its trans-Andean possessions were transferred to the domain of the newly created Viceroyalty of the Río de la Plata in 1776[ citation needed]. Chile gained two intendancies, Santiago and Concepción in 1786 and became a Bourbon-style Captaincy General in 1789. The Chilean colonial society was based on a caste system. Local of criollos (American born Spaniards) enjoyed privileges like the ownership of encomiendas (Indian labor jurisdictions) and were allowed to access some public charges like corregidor or alférez. Mestizos made up initially a small group but came with time to make up the bulk of Chilean society becoming more numerous than indigenous peoples. Mestizos were not a homogeneous group and were judged more by appearance than by actual ancestry. Indians had the lowest prestige among societal groups in colonial Chile; many of them were used as cheap labor in encomienda but their numbers decreased over time due to diseases and mestization. Pehuenche's, Huilliches and Mapuches living south of La Frontera were not part of the colonial society since they were outside the de facto borders of Chile. Black slaves made up a minority of the population in colonial Chile and had a special status due to their high cost of import and maintenance. Black slaves were often used as housekeepers and other posts of confidence. Peninsulares, Spaniards born in Spain, were a rather small group in late colonial times, some of them came as government officials and some other as merchants. Their role in high government positions in Chile led to resentment among local criollos. Mixing of different groups was not uncommon although marriage between members of the different groups was rare. 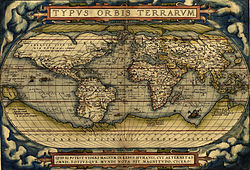 World Map by Abraham Ortelius (1570), where appears the Terra Australis Incognita. For many years, cartographers and European explorers speculated about the existence of the Terra Australis Incognita, a vast territory located in the south of the Strait of Magellan and Tierra del Fuego and reached the South Pole. The Treaty of Tordesillas, signed on June 7 of 1494, set the areas of influence of Spain and Portugal, west and east, respectively, of a line running from pole to pole that was never demarcated (at 46° 37 'W in the Spanish classical interpretation, and further west, according to the Portuguese interpretation), so the Antarctic areas claimed by Chile today, while still unknown at that time, fell within the control of Spain. The treaty, backed by the papal bull Ea quae pro bono pacis in 1506 was made mandatory for all Catholic countries, was not recognized by European non-Catholic states and even by some that were, like France. For Britain, Dutch, Russia and other countries, the Antarctic areas were considered res nullius, a no man's land not subject to the occupation of any nation. New León or Magellanic Lands for Simón de Alcazaba y Sotomayor, which was subsequently extended to the Straits of Magellan. In 1539, a new governorate was formed south of New León called Terra Australis to Pedro Sanchez de la Hoz. In 1554, the conqueror Pedro de Valdivia, who led the Governorate of Chile, he talked to the Council of the Indies to give the rights of New León and the Terra Australis to Jeronimo de Alderete, which, after the death of Valdivia the following year, became governor of Chile and annexed the Chilean colonial territory. Later, in 1558, the Royal Decree of Brussels it prompted the Chilean colonial government to take ownership in our name from the lands and provinces that fall in the demarcation of the Spanish crown in Referring to the land across the Strait, because at that time it was thought that Tierra del Fuego was an integral part of the Terra Australis. There are also stories and maps, both Chilean and Europeans, indicating the membership of the Terra Australis Antarctica as part of the Captaincy General of Chile. Another Dutch document, published in Amsterdam in three languages in 1622, says that at 64°S there are "very high and mountainous, snow cover, like the country of Norway, all white, land It seemed to extend to the Solomon Islands" This confirms a previous sighting of the lands would be the South Shetland Islands. Other historians attribute the first sighting of Antarctic land to the Dutch marine Dirk Gerritsz, which would have found the islands now known as South Shetland. According to his account, his ship was diverted from course by a storm after transposing the Strait of Magellan, in the journey of a Dutch expedition to the East Indies in 1599. There are doubts about the veracity of Gerritsz. At this time was already known the existence of a white continent in south of the Drake Passage, separated from the Tierra del Fuego. In 1772, the British James Cook circumnavigated the waters of the Southern Ocean. ^ a b c d e f Villalobos, Sergio. Historia De Chile, Tomo 2. Editorial Universitaria, Chile. ^ a b c d e f g Historia de la vida privada en Chile. El Chile tradicional. De la conquista a 1840. 2005. Aguilar Chilena de Ediciones S.A. pp. 53-63. Wikimedia Commons has media related to Colonial Chile.